Hi, welcome to Deja Vu Boutique. We are a retail store in Maryland and are here to serve you 7 days a week. Feel free to call us or email us with any questions. Deja Vu Boutique always has thousands of dresses in stock and ready for you to take home. We realize there are many different body shapes and that is why we carry a large amount of stock in all sizes from 000-32. We have every style available including: Mermaids, Ballgowns, A-Lines, High-Lows, Two Pieces, and many more! We also have a very large selection of plus size gowns in stock at all times. 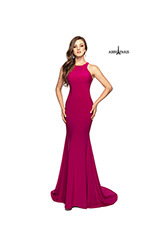 Deja Vu Boutique has dresses for every occasion including: Quinceneara, Batmitzvah, Mother of the Bride/Groom, Bridal Parties, Military Ball, Pageant, Prom, Engagements, Sweet Sixteen, Homecoming, and any Black Tie Event! For school events, we register every dress sold to ensure that we do not sell the same dress in the same color to the same school.We recognize that shopping for a dress can be stressful and our large well trained staff is here to help make this an enjoyable experience for you! In addition, we have staff fluent in Spanish by appointment.